Citation Information: J Clin Invest. 2018;128(10):4682-4696. https://doi.org/10.1172/JCI70712. 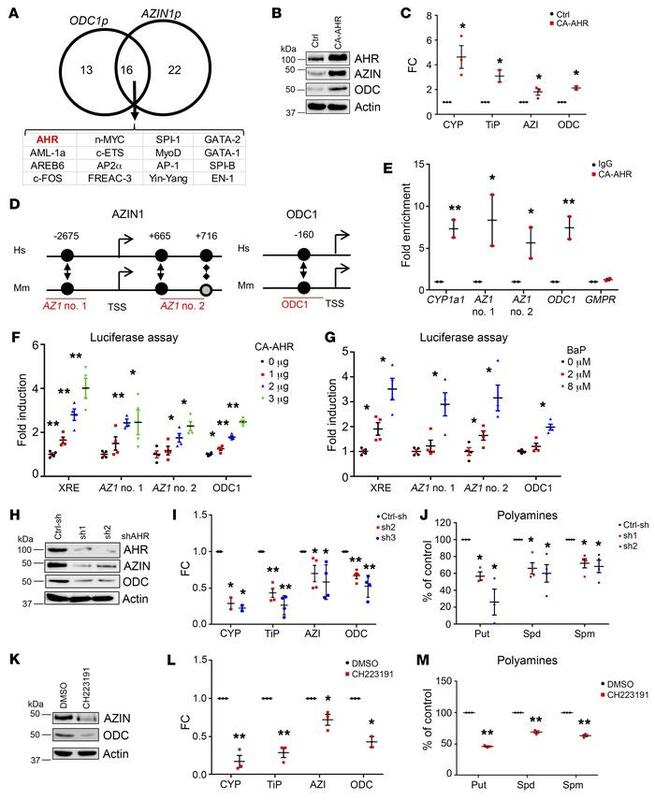 AHR controls ODC1 and AZIN1 transcription. (A) Predicted transcription factors binding AZIN1 and ODC1 promoters. (B) Extracts from WI-38 cells expressing empty vector control (Ctrl) or CA-AHR probed by immunoblotting for AZIN1 and ODC1. (C) RNA from cells as in B probed in qRT-PCR with the indicated primers and probes. Data represent the average ± SEM of 3 independent experiments performed in triplicate. (D) Schematic of conserved (black circles) or partially conserved (shaded circle) AHR binding sites in the indicated promoters. Hs, Homo sapiens; Mm, Mus musculus. (E) WI-38 DNA was immunoprecipitated with control (IgG) or AHR-specific antibodies and probed in qRT-PCR with primers for the CYP1a1 promoter (positive control), regions in AZIN1 and ODC1 promoters described in D, or GMPR (negative control). Luciferase activity for the AZIN1 and ODC1 promoter regions described in D with increasing amounts of CA-AHR (F) or BaP (G). The XRE-luc plasmid was used as a control. Data represent the average ± SEM of 2 independent experiments performed in duplicate. (H) Cell extracts of WI-38 cells expressing control shRNA (Ctrl-sh) or 2 independent shRNAs against AHR (sh1 and sh2) probed by immunoblotting with the indicated antibodies. (I) RNA from cells as in H probed in qRT-PCR with the indicated primers and probes. Data represent the average ± SEM of 4 independent experiments performed in triplicate. (J) Polyamine content in cells as in H. Data represent the average ± SEM of 4 independent experiments. (K) Extracts of WI-38 cells treated for 2 hours with DMSO or 20 μM CH223191 probed by immunoblotting for AZIN1 and ODC1. (L) RNA from cells as in K probed in qRT-PCR with the indicated primers and probes. Data represent the average ± SEM of 3 independent experiments performed in triplicate. (M) Polyamine content in WI-38 cells treated with CH223191 for 48 hours. Data represent the average ± SEM of 3 independent experiments. *P < 0.05 and **P < 0.001, by 2-tailed Student’s t test. AZI, AZIN1 ; CYP, CYP1a1; ODC, ODC1; TiP, TiPARP; Spd, spermidine; Put, putrescine; Spm, spermine.